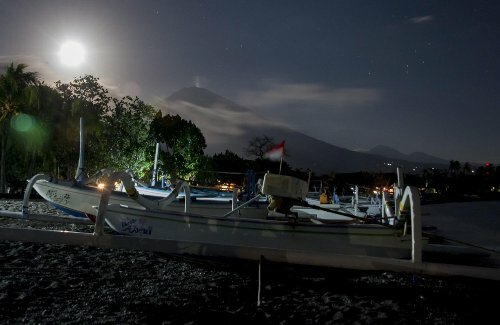 Volcanic ash has fallen onto a number of villages surrounding Mount Agung in Bali following an eruption at the island’s tallest volcano on Tuesday afternoon, less than a month after the alert level was lowered. At least five villages were affected by the ash, including Pidpid, Nawakerti, Bukit Galah, Sebudi and Abang Village. The villages are located within the danger zone of the volcano, kompas.com reported. Authorities from the Energy and Mineral Resources Ministry’s Volcanology and Geological Hazard Mitigation Center (PVMBG) visited the villages following reports from local residents’ to authorities at the Mount Agung monitoring station. “The PVMBG Emergency Response Team found [volcanic] ash, however, the intensity of the ash [falling on the villages] is still light,” head of mitigation sub-directorate at PVMBG, Devi Kemal, said on Tuesday evening. Devi further advised residents not to panic and follow the authorities instructions. “Everyone should remain calm and follow PVMBG recommendations,” Devi said. Mount Agung, which has been experiencing increased activity in recent months, erupted and spewed black smoke at 5:05 p.m. on Tuesday, with the height of the smoke reaching more than 700 meters from the peak of the mountain. Residents are advised to stay away from areas within a 6 kilometer radius of the volcano. The volcano’s status is set at the third highest alert level, the National Disaster Mitigation Agency (BNPB) has previously said. The alert level for the volcano that had forced more than 100,000 residents to flee was lowered late last month, from the highest level to the third highest level, although authorities said there was still a chance of eruption.